Songs of Eretz Poetry Review is pleased to present “Faith on the Wind” by John Reinhart, a Songs of Eretz Frequent Contributor and this week’s Poet of the Week. Mr. Reinhart’s biography may be found in the “About Our Editor & Frequent Contributors” section. Poet’s Notes: My deep-seated sympathy for villains extends to villanelles, loves grown from youthful balladry. Repetition and rhythm more often stand for what rhyme and meter accomplished in previous ages. 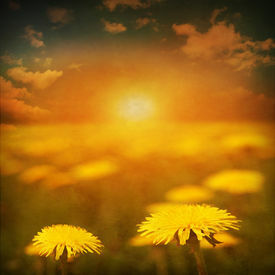 Dandelions are the ultimate in flower and villain, as ubiquitous and useful as baking soda. My neighbors might scowl at the thought, but I work to cultivate the dandelion, spread the good word, and let it flourish until our neighborhood can be seen from space. No other element from nature features so prominently in my poetry, and I hope my children will plant dandelions when I am left only to enjoy their roots.